A disclaimer about the distressed properies update for this month: Our MLS recently underwent some major changes affecting how short sales and REOs are entered and tracked. The previous method relied on status modifiers and existing financing to track these types of listings. The new method is more abbreviated and simply has a field called REO for tracking REOs. Short sales are now listed as either "Active Short Sale" or "Active Short Sale Contingent." When an agent enters an REO, it's as simple as checking the REO box. However, short sales are a little more complicated. First, the listing must be entered as an "Active" listing and then submitted to MLS. After submission, the agent must then revise the listing and change the status from "Active" to "Active Short Sale" or "Active Short Sale Contingent." While this may not seem complicated, remember who we are dealing with. At any rate, I've already seen several listings that are marked short sale in the comments, but not in the status, so I know we're going to have some issues. Enough rambling, here are the stats! As always thanks for the tables. The data seems to contain great news (despite my name I am an optimist) ... the situation is approaching equilibrium. The percent distressed inventory has peaked at 51.52% and the number distressed at 7801. Your post on April 4th indicated sales per month seasonally adjusted may be still declining but only slightly. Sales may hit bottom soon. Prices will continue to decline from inventory pressure but the pressure will quit rising. 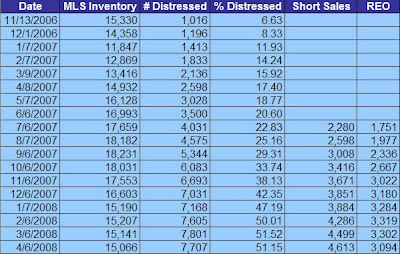 The missing data is number or percent of CLOSED sales that are distressed inventory and the number of new distressed inventory listings per month compared to number sold. Does this exist somewhere? That would show if the situation may be at or approaching maximum decline and give an estimate of how many months or years to absorb all current distressed inventory plus the new stuff coming on line. Not arguing with your suggestions and conclusions. But in my line of work, you need at least 3 data points to call a trend. If this continues next month....I will be much more inclined to think we are leveling off. why is the short sale piling up? will they become reo soon? Perhaps, but if equilibrium is a 50%ish rate of distressed properties, we're in pretty bad shape overall. I'm sure some of the RE "pros" will do the latter. FWIW, I hardly consider a market where half the participants are selling at a loss to be in "equilibrium." Remember, prices are still falling even as inventory stabilizes. Max, interesting article, but there is some theory out there about lack of wage pressure due to MEW (mortgage equity withdrawal) and other easy credit. Who needed to save up a 20% down payment? nobody. Most homeowners used huge tax free sources of funds like HELOCs and Hummer loans to "get their stuff". Now we have to do it the old fashioned way... work for it. You're gonna see a lot of wage pressure soon. I saw the article too on CR. I thought it was a nice very general summary. The problem with wage inflation now is global wage pressures will keep them down. Raise wages and we get more offshoring. Housing prices are already subject to heavy deflationary pressures and wages are just the next shoes to drop. Sure you could argue that this is already happening, just expect it to excelerate and not decelerate. This ties in nicely with the idea that rents will increase. How do you grow rents when wages are stagnant or worse and the costs of staples like food and energy are inflating? Answer is - they don't. I bet we see average wages increase, but not due to pressure. The credit boom allowed for the expansion of the service sector way beyond normal demand levels. That led to the creation of millions of low-paying jobs that drove down the average income. My guess: When the service sector layoffs begin, unemployment will jump, but so will average wages since more higher-paying jobs will remain. The "equilibrium" I was referring to is inventory quantity and quality not price. Before prices quit declining inventory/sales has to quit rising and so does % distressed. Long before prices stop falling the months-of-supply will have to drop down below 6 months. Watching current inventory can predict future prices. I do not have access to MLS or other real estate data bases. To quote Pee Wee Herman about "my big but", Is there a data source that predicts local future incoming REO's relative to current or future REO sales? Is there a data source that predicts local future incoming REO's relative to current or future REO sales? Are you talking about prices or inventory? The Countrywide Foreclosures Blog does a good job tracking CFC's raw inventory. I've established that CFC doesn't list all their inventory in the MLS, so there is a backlog. I am talking about Inventory (# for sale). The CFC page was new and informative. It says CF REO's have peaked at 15,750 on about 1/10/08. The number of CF's REO's is down to "only" 14,541 as of 4/3/08. Notice however total California REO's is still rising but appears to be reaching a "Max" at about 4,500. Now how about Sacramento? To determine when we will peak on the number of REO's it would be good to watch the number of new REO's added to MLS every month and compare to the number REO's sold each month. Can that be determined from the MLS? The interest in inventory is because it drives prices (Do you agree?). The rule of thumb I have heard (for normal markets without all the REO's) and have some analysis to support is house prices do not keep up with inflation if months of inventory is over 6. When there are more than 9 months of inventory prices fall. There seems to be a delay of a few to many months between inventory levels changing and the corresponding price change. The net of all this is months of inventory is a leading indicator of prices. I am interested if you agree. drdoom I'd like to see trend based on your premise. The rule of thumb I have heard (for normal markets without all the REO's) and have some analysis to support is house prices do not keep up with inflation if months of inventory is over 6. I don't disagree with your basic reasoning (more supply = lower prices), but I'm not sure you can draw a complete picture by just looking at those two factors; eg: why did prices fall at all to begin with? Methinks credit availability and serviceability also plays a role. If no one can get a loan, prices fall regardless of supply. If salaries aren't high enough to service the debt (in aggregate), foreclosures will happen until prices fall to a level where the debt is serviceable. I am interested in your analysis on the 6 month number. I've seen that number in the press for years, but nothing substantive that backs it up.